FIGURE 1. 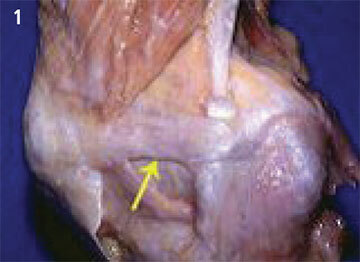 The medial patellofemoral ligament (MPFL, yellow arrow) is a very thin ligament approximately 6 cm long. FIGURE 3. X-ray showing hardware placement for MPFL reconstruction. A true lateral view is necessary to correctly locate Schottle’s point. Seven to 10 days after surgery, patients begin rehabilitation with active and passive motion and work on regaining muscle tone; at two to three weeks post-op, they may begin progressive strength training. During follow-up, Dr. Sebastianelli watches for red flags, including infections, which signal a potentially poor outcome. 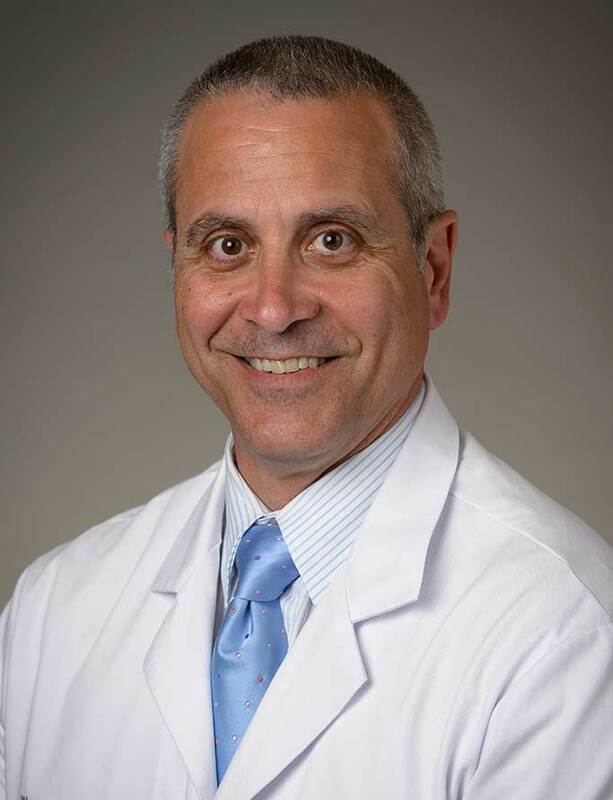 He notes, “Knee stiffness is a sign that the ligaments may be entrapped by scar tissue, or the graft is too tight, with not enough play to allow the full range-of-motion.” In such cases, a second surgery may be necessary to address the issue. Fellowship: Sports medicine, Penn State Health Milton S. Hershey Medical Center, Hershey, Pa.
Residency: Orthopaedic surgery, University of Rochester Affiliated Hospitals, Rochester, N.Y.
Medical School: University of Rochester School of Medicine and Dentistry, Rochester, N.Y.
Hawkins RJ, Bell RH, Anisette G. Acute patellar dislocations. The natural history. Am J Sports Med 1986;14:117-20. Steensen RN, Bentley JC, Trinh TQ, Backes JR, Wiltfong RE. The prevalence and combined prevalences of anatomic factors associated with recurrent patellar dislocation: a magnetic resonance imaging study. Am J Sports Med. 2015 Apr;43(4):921-7.